Just before the sun made its appearance, she woke up, made oatmeal for her family and organized her day. She worked at staying ahead on the laundry and clothes-repairs. Exercising helped her stay strong and gave her the energy to tackle her many tasks. Her words to her children and others were wise and kind. I bet you recognize her now. Yep, she’s the Noble Wife of Proverbs 31. If you are like me, most of the time you feel like you don’t quite measure up to her. But that doesn’t mean you can’t learn something from her example. Why can she laugh? She is not worried or overwhelmed because she is diligent and prepared. She uses her time wisely and thinks and plans ahead, instead of just living in “reaction mode,” as I naturally tend to do. She has a plan and she works it. What would “the Noble Wife” do with her summers if she was homeschooling momma like you? I bet she would think ahead, identify her priorities, and make plans to address them with her and her children’s activities. 1. Start early preparing for your next homeschooling year. Before you get TOO relaxed this summer, take a little time to assess this last year. How did things go? Did you love your math program and want to stay with it? Was your history program boring and too hard to teach from? Did you incorporate enough of the “fun” stuff, like projects, art and music? Do you have enough nature study, field trips, and hands on learning? Did you spend too much time in the car this last year? Do you want to include more literature in your homeschool? Take a hard look at this last year so that you have an idea of what needs to change for next year. Don’t forget to ask for feedback from your kids on these things. And start investigating! Who is behind this company? Is this someone who actually homeschools or homeschooled? Did they homeschool through high school? What are their graduated children doing now? What is their customer service like? Is the person on the other end of the email friendly, helpful, and knowledgeable? 2. Make self-care a priority. Admit it: taking care of YOU is the last thing on your list, right? Summer is the perfect time to spend a little extra time relaxing and getting more sleep. If you have let your exercise program lapse a bit trying to get school finished up, get it going again! Make sure you have strength training in there a few times a week along with your cardio. Even though all you feel like doing is lying on the beach with a great book, pumping iron and getting moving will make those times when you DO truly relax even sweeter. And while we are on the subject of self-care, it might be time to take a hard look at your eating habits. Are you drinking enough water? Are fruits and veggies part of your daily routine? Summer is a great time to put some new healthy habits in place! 3. Commit to brushing up on training your kids to have good habits. During my homeschooling days I got crazy tired with so many things going on that sometimes the last thing I wanted to do was stop and deal with an unruly child. Or make one clean up his bedroom instead of just doing it quickly myself. Do you “let things go” when you’re tired and there are other things you would rather or need to do? Instead, make it a summer priority to deal with poor attitudes, unkind words, selfishness, sloppiness, and the rest of those habits we struggle with during the school year. For school (and family life, for that matter) to go smoothly, your kids have to be trained to listen attentively, be kind to their siblings, learn to serve the family, and keep track of their belongings. 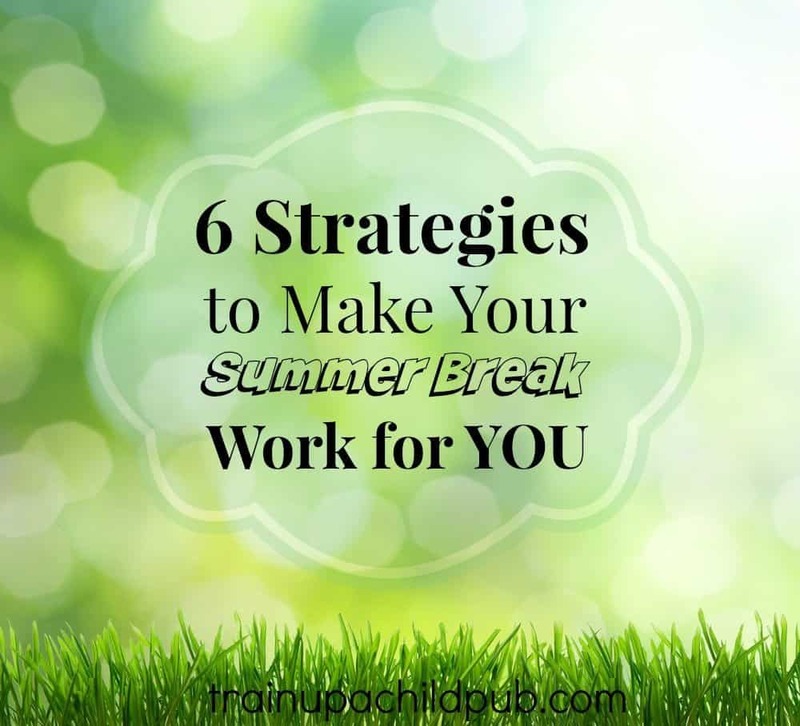 Your homeschool will be MUCH more productive and effective if you brush up on these and other basic habits this summer in preparation for when you’re ready to ramp up with academics again. Character training is ALWAYS time well spent and yields many dividends in the days, months and years ahead. 4. Read, write and do math over the summer. For the longest time, I didn’t know that “summer learning loss” was a thing. You wouldn’t believe how important this is to your elementary children, middle schoolers and high schoolers. Did you know that summer learning loss is cumulative? Or that the summers before and after middle school are about the most important ones of your children’s academic career? Read the links above to learn what you can do to combat this and plan accordingly. Make it fun! Play learning games on the computer. Do some academic work outside, or at the pool, or the lake. Use an hour in the morning to get some things done so everyone can look forward to the break after. Or, if you live in the South like me, you are outside in the morning and save your inside work to do during the afternoon’s blistering heat. Get your record-keeping done if your state requires it, and toss the extra papers you don’t need for your portfolios. Go through those projects, take photos of them, and in the dead of night chuck the large ones you don’t have room for. File what needs to be filed. Try all your markers and pens and toss what you need to, making a list of what needs to be repurchased. Take a look at your curriculum (see #1) and sell what you don’t need or want to keep. Get those library books back to the library before they are overdue – and while you’re there, sign your readers up for your library’s summer reading program. 6. Organize your COMPUTER spaces. Sometimes this is our last frontier! We can keep the floors swept and the bathrooms clean, but our computers are such a mess we can’t even find that amazing article on Ancient Egypt we couldn’t wait to use, the e-book about how to design your own literature-based high school courses or that link to the online game that teaches you the capitols of the states. Let alone get to the bottom of our email inbox! Set up folders in your computer for each child, each subject or unit you are teaching, and store the digital items in the place where you can find it when you need it. My preference is to use Dropbox for this purpose, so you can access your digital items from any of your devices and they are all automatically “backed up” because they are web-based. Another program I use for resources is Evernote. In Evernote you set up virtual notebooks, and you have the advantage of creating multiple “tags” for your digital products to help you search for them. For example, if you have our e-book, Design Your Own Literature-based High School Courses, you could put it in a “Curriculum” or “Curriculum Helps” notebook, then tag it “e-book,” “high school,” “creating your own high school courses,” etc. It just takes a little thinking ahead and planning. You’ll be so glad you did! What do you need to start on first? Tell me by commenting below! P.S. Would you like to have this post in a printable, .pdf format? Click Here. This was just what I needed! Summer is screaming by and I need to get back on track so we will be ready for school to start again in the fall and also have plans for some fun activities during the summer. I’ve just recently come across your blog and am looking forward to reading more! Thank you! Great post! This is worth printing. I tried to print and it’s too big to fit on page. Is there a way to make a PDF version? Thank you! Thanks, Leslee! Glad you found them useful and thanks for stopping by and sharing your thoughts.